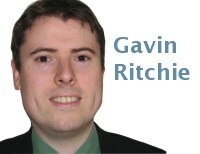 Against a background of long-term mortality improvements it is understandable to expect that societal change and developments in health care will be agents of progress. Recent research from Princeton Professor of Economics Anne Case and Nobel prize-winning economist Angus Deaton jolts such complacency in the starkest way. It reveals that since the late nineties, the all-cause mortality improvements experienced by white non-Hispanic Americans in midlife (ages 45 to 54) have not simply slowed, but slammed into reverse. "...the increase in all-cause midlife mortality that we describe has not been previously highlighted. For example, it does not appear in the regular mortality and health reports issued by the CDC, perhaps because its documentation requires disaggregation by age and race." We can see the change in all-cause mortality rates that took place over the period considered in the following figure. We've discussed before how a mortality impact can disproportionately affect a specific sub-population. Where a group proves for whatever reason to be more or less vulnerable, trends in mortality and morbidity react accordingly. The scale of mortality change in this case is so significant that the authors compare it to the US AIDS epidemic, and carefully consider which drivers lie behind it. While there are many issues with forecasting mortality by cause-of-death there is no doubt that retrospective examination of by-cause data is hugely valuable in determining the drivers of observed mortality change. In common with a case closer to home, this research demonstrates that the majority of the impact stems from psycho-social causes — suicides, drug and alcohol-related poisonings and chronic liver diseases. The authors point out that growth in these causes is strongly evident across all five-year age groups from 30 to 64 in the population under discussion, but only in midlife is the swing "large enough that the common growth rate changes the direction of all-cause mortality". 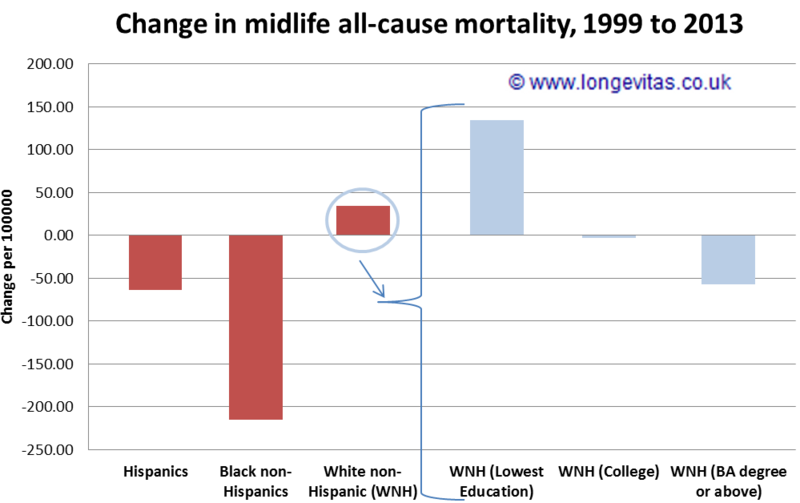 The authors do not claim definitive understanding of this midlife crisis in white non-Hispanic US mortality. However, they highlight two significant factors — growing financial insecurity and the increased availability of strong opioid prescriptions since the mid-1990's. The impact of strong opioids in the US has been noted in previous research, and legal action has already been taken over products misbranded as non-addictive. This research, in its examination of mortality in comparison countries suggests that other health systems have proved more resilient to this specific threat thus far. However, we'd be foolish to imagine that anywhere is immune.